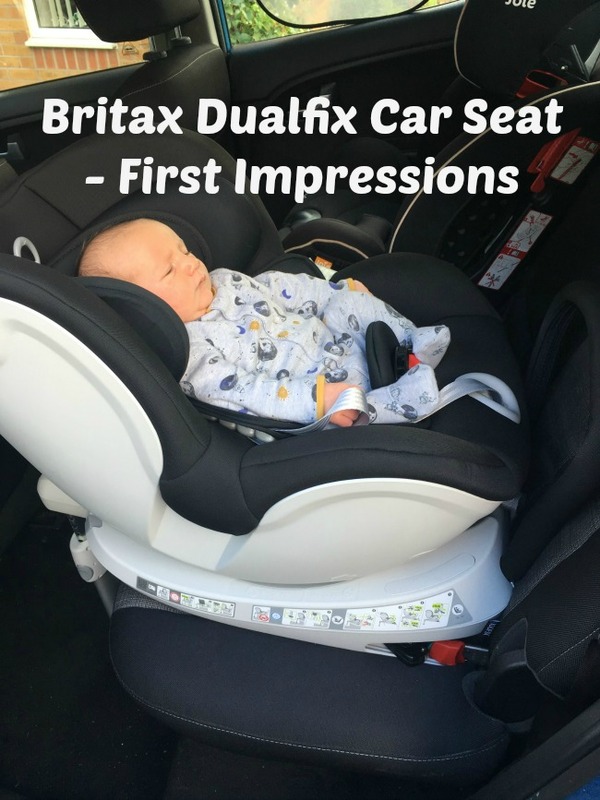 We were overjoyed to be given the Britax Dualfix car seat to review*. 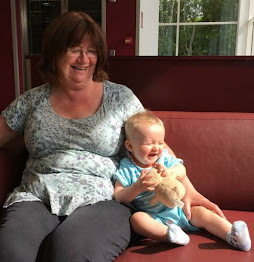 With our second grandson we were looking for a car seat that swivelled. 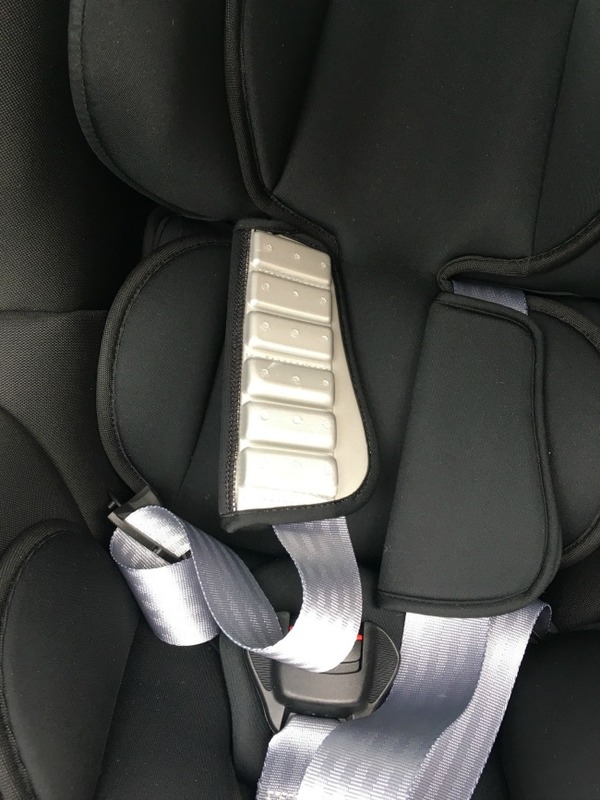 We found one of the hardest things with Bear was putting a squirming baby or toddler into a rear facing car seat in our Kia Venga. It is a smallish car which has ample room in the front but a bit restricted in the back. Even if it wasn't the law we want our grandchildren to be rear facing as long as possible. We didn't want the struggle to get them in to become an excuse to turn them at the first opportunity. 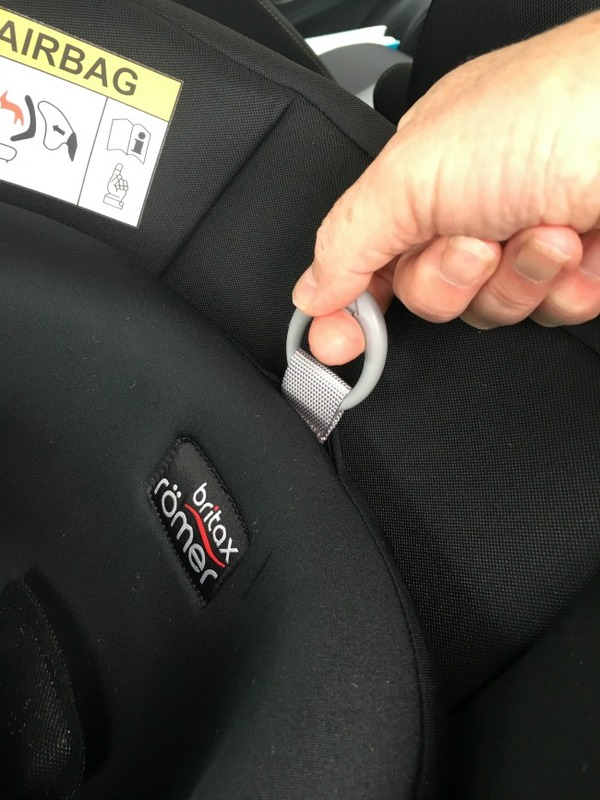 The Britax Römer Dualfix is a 0+/1 car seat. This means it is suitable from birth to 18k (approx 4 years old). It is suitable for rear facing up to the weight limit and has a 360 degree rotation. Once fitted in the car it easily turns to the side to put baby in or out and then swivels back again. 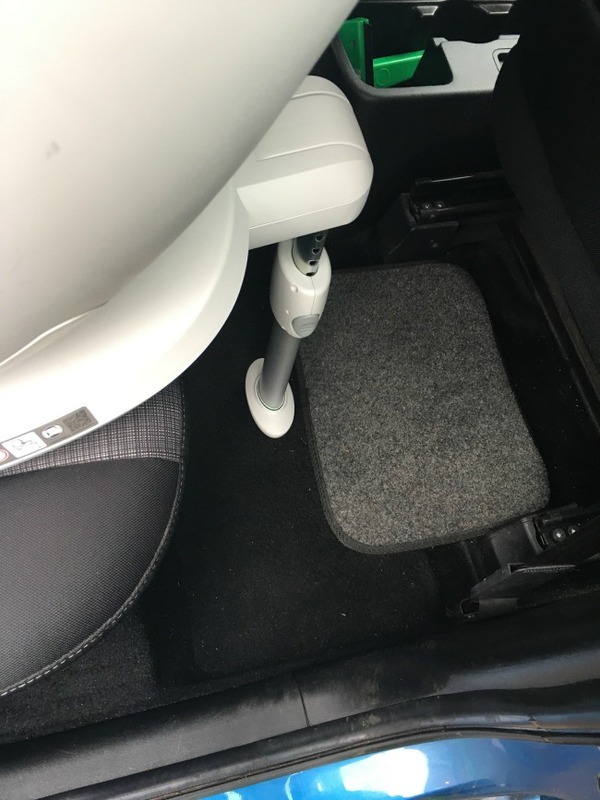 It comes as one piece, with the isofix base attached. 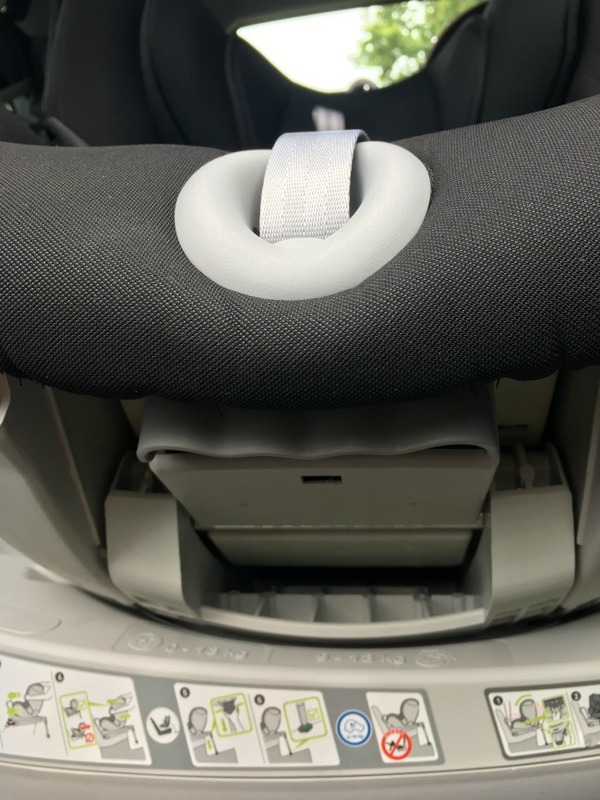 The Britax Römer Dualfix car seat feels well made with lots of padding. The newborn insert is already fitted and the covers are removable for washing. The instructions say that they can be removed without dismantling the harness but we haven't tried that yet. 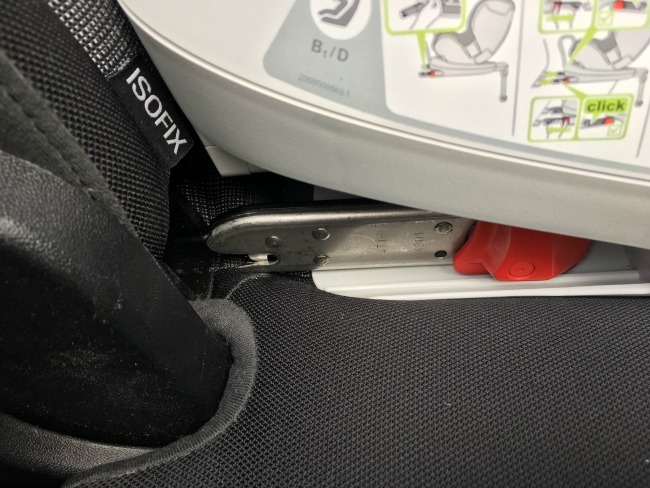 The isofix base is attached to the seat so it is all in one piece. This makes it quite heavy. If you are looking for a light weight car seat to carry to and from the car this isn't for you. 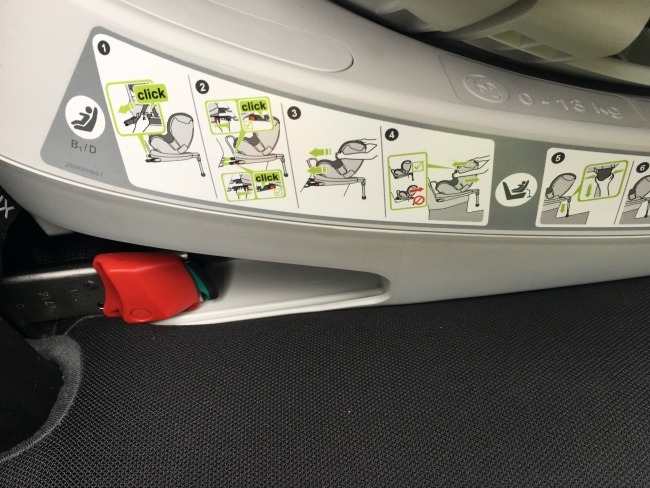 Due to the isofix base being attached it doesn't fit to a travel system. This is not a problem for us at all. 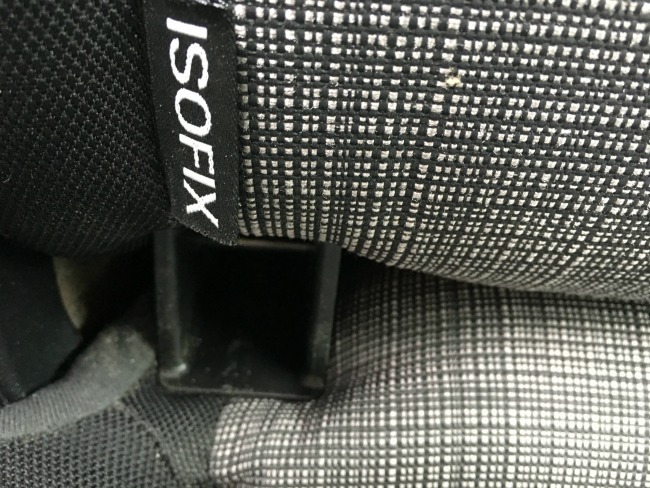 We are looking for a safe, extended rear facing car seat that turns to allow easy access. This is perfect for that. It has a 5-point harness and the straps glide easily. One pull while holding down a button releases the straps and just pulling the strap tightens them up again. I was a bit concerned about the chest straps, they have firm blocks which are described as "performance chest pads to prevent forward movement". They just seem a bit hard to have against a newborn baby. The rest of the padding is very soft. This was easy once we had read the instructions and tried it. If you were buying one I would suggest buying in store so you have expert tuition to ensure the seat is fixed correctly. If not, do make sure this seat is compatible with your car. We found fitting it in our car very straight forward. 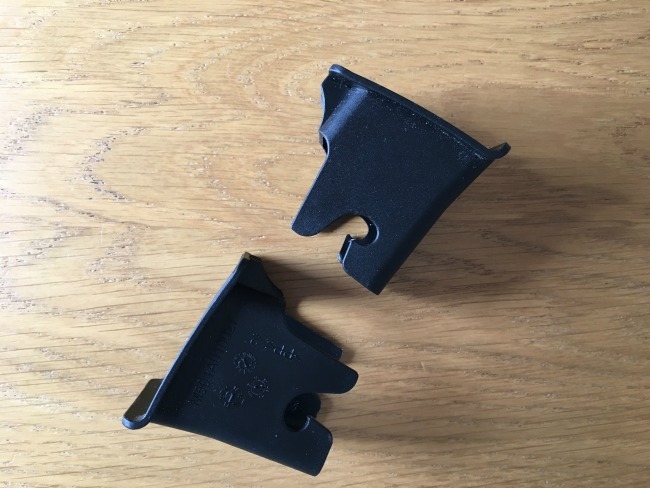 There are two black plastic isofix clips. these push in to protect the upholstery in the car. These were very stiff to put in, but OK to remove. Once they are in place it is just a matter of pulling a strap to extend the clamps on the seat, lining them up and pushing in. When they are in the correct position a green line can be seen. The foot is easy to extend and again when correctly fitted a green line can be seen. That's it, fitted. Just right of the red plastic piece is a thin green line. This confirms that the seat is fitted correctly. 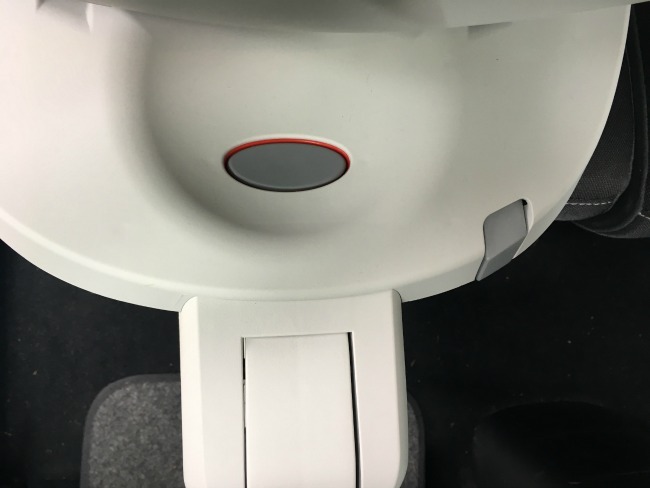 The foot also has a green line to confirm it is fitted correctly. To adjust the head rest and harness is very simple, just pull on the ring until it is in the correct position. everything moves together so no fiddling about. To swivel the seat needs two hands. There is a large button to press and whilst it is depressed a handle is pulled. It is a very easy movement and the seat glides effortlessly. As it needs two hands this cannot be done with a baby in arms. It isn't a problem now I realise, as I would turn the seat and leave it sideways ready for the next use. The handle to swivel is located under the seat and easy to locate and pull. Our gorgeous new grandson hates cars and hates car seats. He cries as soon as he is put into one. This does make it difficult to get his opinion on comfort and ride. I waited until he was asleep and placed him in the seat. It was so easy. A quick swivel and he was ready to go. I didn't put the harness on as I didn't want to wake him up, I just wanted to see how easy it was to put him in and take him out. Just a quick swivel rear facing (once the harness is done up) and the baby is ready to go. Our first impressions are that this is just what we were looking for. It feels good, solid and a quality build. Each step is really easy to perform. We were looking for a car seat that swivels so that it is easy to put a baby and a toddler in. This does that perfectly. Adjusting the harness is simple and when forward facing it has multiple positions. The only negatives would be if you wanted to move the seat from car to car often. 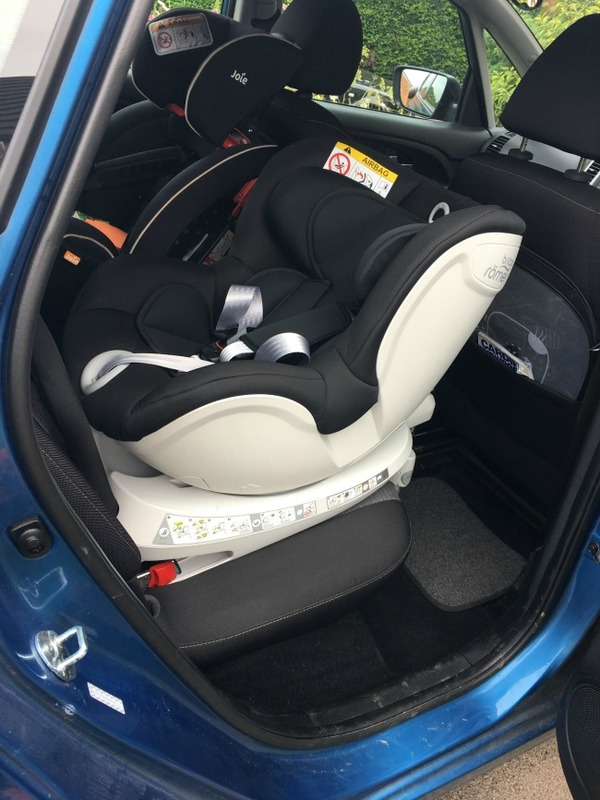 Although the actual fitting is straightforward the seat is heavy and if you were moving it regularly then the advantage of having a swivel car seat to protect your back would be lost. We will write a full review when we have used it for a few months. I remember the struggles we had trying to get a baby into a rear facing car seat, even when they were co-operating. I think we will love this. 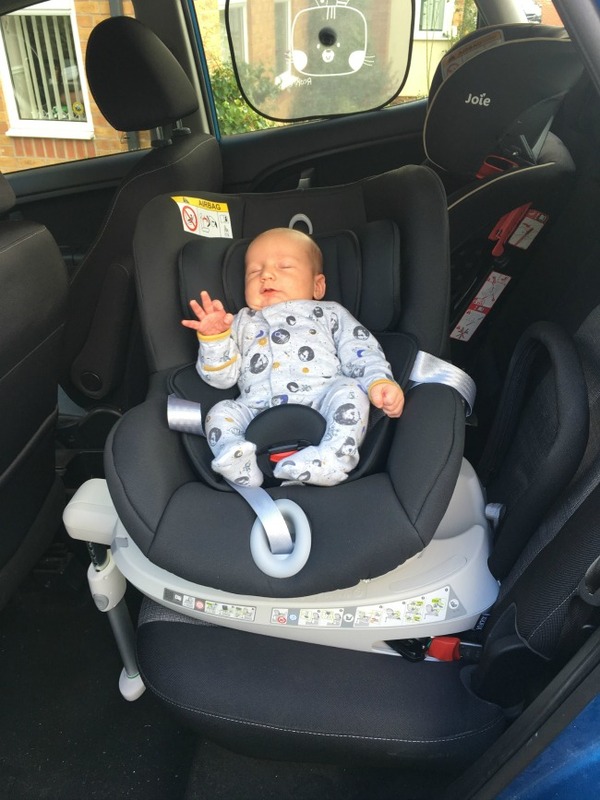 Britax Römer Dualfix Car Seat costs from £299 and is available in a choice of colours. * Disclosure - We were gifted the car seat for the purpose of a review. All opinions are honest and our own. This car seat looks excellent. The swivelling is to handy as it means they can rear face without such a struggle. This would be handy for my Fiesta! It's great that there's an indicator to let you know that the seat is fastened properly! My step father is an ex fireman so I am all about safety. The fact that it can remain rear facing for as long as it can makes it a must purchase in my book. We need another seat for my husbands car so will be looking into this one as I think it will be perfect. Love the swivel feature so it is easy to transfer a sleeping child. Looks like a great carseat. A very thorough review, thanks! This is a really attractive seat and love the swivel feature. Your baby is so cute too! !